Know someone who covets their car? 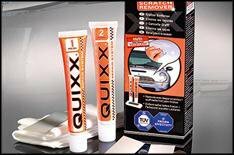 Then this Quixx car-scratch remover will be the perfect present. The pack contains tubes of scratch remover and polish, along with a lint-free polishing cloth and four strips of special-grade wet/dry paper. A great gift to top-up the stocking. These valve caps make it easy to see when your tyre pressures are starting to drop. If the pressure starts to fall, the valves will display yellow for caution and red for danger. Inspired by the design of the single central wheelnut of the current Porsche 911 Turbo and 911 Turbo S, the heavy-duty design includes original Porsche crest and logo. Bring that extra touch of class to someone's bottle of lager this Christmas. Smiley faces, thank yous and apologies are all programmed into this LED sign for the back window of your car. Send your fellow motorists a message at the push of a button and bring back some good manners to our roads. Or push the button that flashes up 'back off' and see if there'll be any fireworks. The ideal gift for young petrolheads. Okay, the Indianapolis Air is actually pedal-powered, but you get the idea. It has an adjustable seat, air-filled tyres, a rear handbrake and comes with a three-year warranty. Suitable for kids aged five to 12. At last, a self-stirring mug to prevent those persistent wrist injuries that blight caffeine addicts across the globe. The cup is also insulated, so your beverage wont lose its warmth as quickly on those cold winter mornings. Caterham's self-build kit is 3000 cheaper than buying the factory-built car. It's great fun to make and to drive just don't expect to have it up and running for a Boxing Day. Never lose your car key again. It happens be honest but the GPS keyring will direct you right back to where you left it. Simply 'lock' in your starting location, go and do your thing, then follow the device's idiot-proof LCD display.